Born in 1929 in St. Louis, Missouri, Shirley Thomson-Smith's art has been deeply and profoundly influenced by the experience of living in Durango, Colorado and traveling through New Mexico. 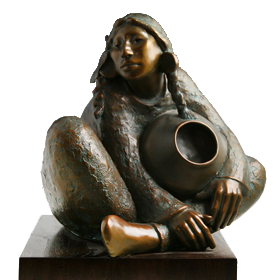 There Shirley Thomson-Smith observed the powerful tradition of Native Americans and was particularly drawn to the strength, character and symbolic role of Native American women. Shirley Thomson-Smith - Oh Lord!